I am so honored and excited to be a contributor to the latest (Holiday!) issue of Delighted Magazine. There is nothing I enjoy more than searching for the perfect gifts for my loved ones. Well, okay maybe entertaining. And cake. But gift-giving is definitely up there! 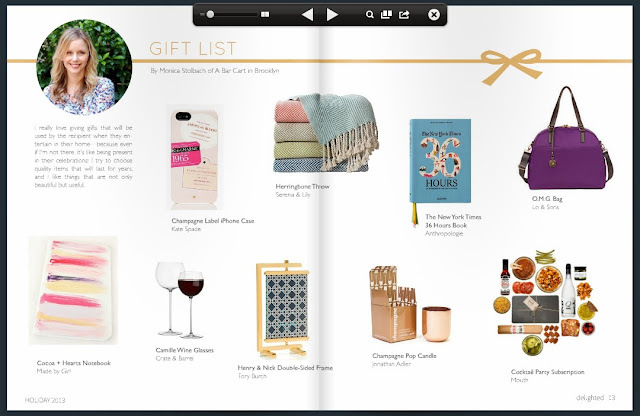 So when the lovely Amanda Gomes of Delighted asked me to compile a list of my top picks for 2013 holiday gifts, I was thrilled. If you haven't yet discovered Delighted Magazine, you are in for a treat. Every page is oozing with charm and happiness. I suggest you drop everything, pour yourself some tea (or champagne!) and and read it cover to cover. You can find the current issue here. And archived issues here. Notes about a couple of these items: Lo & Sons is currently offering 20% off all of their bags with code PRETHANKSGIVING2013. I have the OG and it has honestly changed my life. People who are crazy about organization and travel will understand. The Camille Wine Glasses - elongated stem, bubble bowl - are what Olivia Pope uses on Scandal. I'm SO tempted to buy a set of these to designate as our official Scandal-watching glasses, and eat some popcorn for dinner, just like Ms. Pope. In case your bar cart is also in need of an autumnal makeover, Mrs. Lilien has a style guide she is calling Le Fall Bar Cart: Your Must-Have Bottles and Props - this is a must-click. So much fun. The Effortless Chic posted The Savvy Girl's Guide to Hosting a Stress-Free Party. My favorite line is: "It is such a temptation in this day and age to project unrealistic expectations on ourselves that keep us from exercising the simple art of hospitality." Well said, and sadly so true! A fun article in the New York Times called "Bar Carts: Wheels With a Buzz." I like this guy's style. Confused about your pie crust for next week? Food52 has you covered. Pie Fats: Butter vs. Oil vs. Shortening vs. Lard. I can't believe I didn't mention this earlier in the week: I really couldn't have pulled off Friendsgiving without the help of Foragers City Grocer. They not only cooked our turkey for us, timing it to be ready exactly when we wanted to serve it, but they let us borrow their roasting pan and oven mitts to carry it home. If you're in the NYC area (they have locations in both Dumbo & Chelsea) you should check out their full Thanksgiving menu. I hope it's been a great week! !